As windows and buttons are both widgets, WMResizeWidget() is the same as for the window above, just as the function to set the background colour. Sizing and moving is in pixels, movements are in pixels from the parent widget's upper left corner. The default action on a button, which is a mouse click, will call the WMAction function, just as happens with the CloseAction on the window. WMAlignment can be WALeft, WACenter, WARight or WAJustified. By default a new widget will be placed in the window's top left corner. WMMoveWidget is used to place it correctly. In the WMAddBoxSubview function, setting expand to True will stretch the button to the height of the box. space sets the space after the button. To resize the widgetbox with the window, you can use the WMSetViewExpandsToParent function. Otherwise, you can calculate your own positions, and move the box to where it is supposed to be in a resized window. There are other ways to group buttons, or other widgets, eg. by a frame. To know the current window's size, and the size of any other widget, there is the function WMSize WMGetViewSize (WMView *view). As before, the function WMWidgetView casts the widget into a view. WMWidgetScreen returns a pointer to the screen in which the widget was created. We thus can get the window's size, and place widgets in their correct positions. What is left to do is a function which handles the event that the user resizes the window. The buttons, or the box containing them, should move to their correct positions in the window again in such an event, or resize with the window itself. There is an event WMViewSizeDidChangeNotification when the window is resized. For a WMWindow win, passing WMWidgetView(win) as the last argument to the function below will define what to do when this event occurs. The third argument should be the event's name (WMViewSizeDidChangeNotification), and the first argument is the name of the function which will be called. This function should look like void observerAct(void *self, WMNotification *notification). It is all done in the sample code here. The buttons keep their size, but are moved to stay in the bottom right corner, the text area is resized along with the window, but stays 80 pixels away from the window bottom border. We also do something useful with the mouseclicks on the window itself. This is done in the function handleEvents. The event ButtonPress has the click time and position in a member .xbutton. When the button is pressed, we get that information, and print it to the text area. The text is written to the area by passing character strings to the WMAppendTextStream function. The box is created before the button is, because the button will have to be created with the box (its parent widget) as its first argument. The box is the "outer" widget and will be mapped with WMMapSubwidgets, but we map the buttons separately. The function which will be called on the default button event is closeAll() for the quit button. The file button will call the selectFiles() function, in which we open a file selector widget. We have left it to WINGs to decide what size the button will be. We temporarily use ButtonsetSize to store this size. We add the button's view to the box. After adding all the buttons, We store the size of the resulting box, and use it in our resizeHandler function to keep the box in the corner. .Following the source code, pressing the file button will pop up the file selector dialog, and the name of the selected file is printed in the text area. 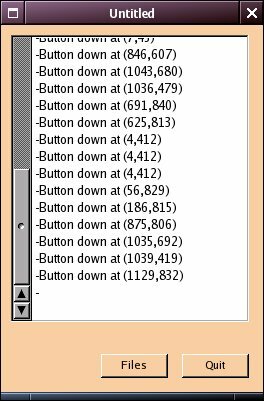 Notice that, without the box widget, we would need two global Button pointers to change the position of both buttons in the resizeHandler function. We now need one Button pointer, which can remain local to main. Here is the full code which we have now. As we have a text area, we can print text to it, as long as we are sure that the widget has not been destroyed. The scroll bar next to the area is obtained with one single function call. The three steps up till now have shown the important points in programming with the WINGs library. The basics are all the same all the time. Create, specify WMAction, define the WMAction function somewhere, WMMap the widget. If this won't do, use PostNotification, and AddNotificationObserver to the widget which should react to it. From the next sections, the library description gives a whole range of widgets which you can fit into the window this way, and related functions and data structures. There is sample code for those widgets whose code seems a bit more involved. The only thing which cannot be obtained by a simple function call is a menu with submenus, which is to work under any window manager, not just Window Maker. The third programming detail section explains, how to programme this kind of menu. The other two programming detail sections are not about the WINGs/wraster/windowmaker libraries themselves, except for a short section on the use of the WINGs functions to insert icons into widgets. Detail section 1 contains an example of how to get rid of the disappointing xterm window which you need to start your windowed application from, to read its messages on stderr or stdout. It shows the standard code to open a logging window on the screen when needed. For convenience, it uses xconsole for this, a standard application on unix systems with X11. The same section 1 shows how to get the correct information about monitor resolution when a virtual screen is used. Detail section 2 gives code samples which demonstrate how to mix Xlib code with the WINGs library. 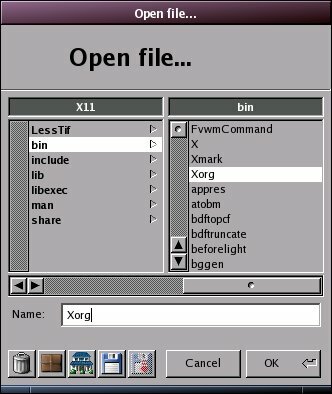 Xlib is the library which gives direct access to the X-server, and which is the underlying code to the WINGs library itself. It also contains a section which shows how to use OpenGL 3D graphics code in a WINGs frame. These extra sections do not explain all the details on the used libraries. However, by just following the code examples, you can reproduce their results, and change them to use them in your own programmes.